I love picnics! They are so much fun and so intimate, I feel like whenever I go on a picnic with my hubs we just bond on another level. I love being outside too! I got this dress at H&M and am loving it! I love the modest length and light weight material. It is perfect for the Summer heat, so perfect that I bought it in every single color!!! Obsessive much??? goodness girl…. I couldn’t help it though, it is so hard to find modest Summer dresses so when I finally found one that I liked I was going to make sure I would a few on hand for quite some time LOL I also have to share with you one of my favorite spa night items I have been using lately. With all of the outdoor activities I have been doing lately I feel like my face as really taken the heat… literally, my face has been getting so much sun and I hate that. Nothing ages you more than the sun. I have been using the ITWORKS face masks and am loving them, I am all out and need to get more. They lift and firm your face and diminishes fine lines and pores, not to mention how hydrated my face feels afterwards. It is safe to say I am completely in love! You can get yours HERE! Thanks for stopping by, hope you have a great Monday! Hi Jenessa! I love the striped dress and ur smile! I never would have thought that a black floppy hat would work in the summer but you made it work!! haha I know kind of risky but I love it! thanks for stopping by! kisses! Such a cute dress and I adore that hat as well! Honestly, I don’t use anti aging products a lot but when I do, it’s usually to fight the sun. I totally agree that the sun can really damage our skin. And ps I love your hat!! I am the same way! I hate the feeling of worn skin from the sun! Thanks for stopping by doll! What a great outfit. That dress is beautiful and I love the hat! its a great find!! I wear it all the time! Stripes are such a staple, simple and chic! Love your hat! I never wore Itworks, but I hear it is very good, from a friend. I love picnics as well and I loved your photos and dress! The makeup is also amazing and the hat too! I hope you enjoy a very nice week and be careful with the sun! Hi Denise! 🙂 I have extra facial wraps on me if you want to try one. I’m the one that sent them to her to try bc they are so awesome! They don’t get near the credit they deserve as the body wraps. Contact me anytime I would love to help you! Yeah it works well! thank you for your sweet compliments! happy you stopped by! have a great day love! I love them! you should def try them out! thanks for your sweet compliments, happy you stopped by! oh thank you doll! I know modest dress shopping is probably the most frustrating thing LOL so I went all out when I found one hah xo Thanks for stopping by love! A dress with pockets is always a win for me! I’d buy a few to have on hand as well. 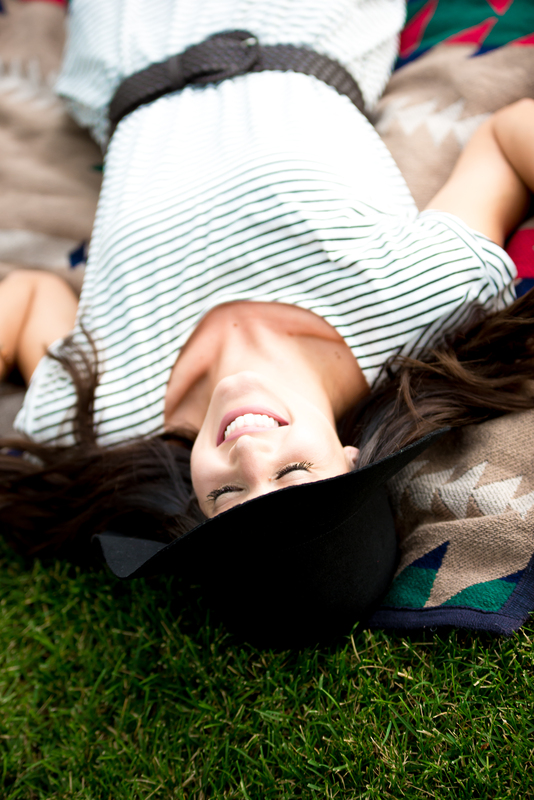 Love your hat and it looks like you had a lovely picnic. I love this dress and really love the hat! You look gorgeous in all these photos!! thank you babe!! i died when I saw them too! and they are so affordable! Cute look! Totally in love with your hat. Summer hats are the best! That dress is so adorable! I have a similar hat, and a dress like that one is exactly what I need to feel like I can pull it off when I’m not at the beach. Thanks for the inspiration! 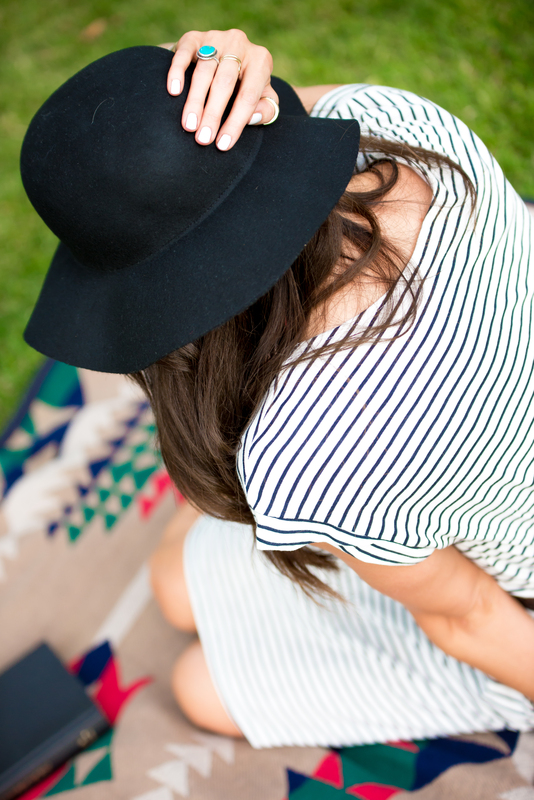 I’m loving your stripped dress and floppy hat! So perfect for a picnic in the park. Your ITWORKS face mask sounds amazing. Is this a mask you use nightly or weekly? Yes the mask feels wonderful! thank you love!! i am glad you like them! thanks for stopping by gorgeous! What a perfect picnic dress! You need a dress that you’re comfortable enough to sit and relax in! You are so pretty my dear! love your rings. You were born to wear that hat…soooo fabulous!! You gotta wear that hat in a post with a touch of old, Hollwood glamour inspiration. And I love the striped dress, too! Such pretty pictures! Love the stripes and that hat is gorgeous! I love picnics too they are the best!! You look beautiful in this dress! OBSESSED with these pictures!!! so fun!!! Such a pretty outfit you’re wearing here dear! These pictures are great, you look so beautiful! This is such a cute look! I just love the hat you’re wearing! Gorgeous! Lovely photos! Comfortable and chic outfit! Gorgeous dress. But I just love the hat! I always wanted one of those hat but never lucky enough to run into one. I love your dress it looks really light and airy, and in this heat we need light and airy, but we can’t complain too much it is a lovely summer, and we love picnics!. Very cute outfit for a summer picnic!